Basic food is still beyond the reach of millions of people in Syria as rise in prices and disruption of livelihoods among other impacts of protracted conflict continues to affect the population. Since 2014, USAID-funded Syria Emergency Food Security Program (SEFSP), has worked to alleviate food needs of vulnerable families in Northeast Syria with provision of quality fresh bread at a subsidized price to host communities and free-of-charge to IDPs and refugees. Faraj Ali Al-Sofi and his family, residing in Qahtaniyeh Sub-District, Al-Hasakeh Governorate, is one of the thousands of families benefiting from bread provided by Blumont-supported bakeries. Faraj’s family suffers from harsh economic conditions with an average daily income of 500 Syrian Pounds (SYP) (less than USD 1). Faraj, a 25-year-old daily laborer, is the only breadwinner for his family consisting of: three children, Ahmad 5, Ayham 4, and Rudaina 2, wife (Thawra) 25, and mother-in-law who is over 60 years old. “Our 500 SYP income is very meagre, and we sometimes borrow money to buy the most basic daily needs. We have been receiving bread supplied free, for about four years from the Bread Distribution Agent (BDA). This has helped us save the money that would have been spent on bread to buy other needed items. We thank Blumont for providing subsidized bread,” said Thawra. After meeting with Faraj and his family, Blumont team met with the BDA who has been giving them bread. 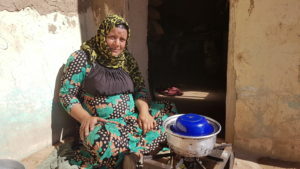 “I offer bread to two families, including Faraj’s, in the same village, as their living conditions are not good. They suffer from poverty and have no regular income. Buying them bread does not affect my income, because the price is affordable compared to the prices of other non-supported bakeries and local market.” said the BDA. SEFSP’s subsidized bread being affordable is not only helping thousands of families meet their basic food needs, but also has enabled local people to assist each other whenever possible. SEFSP, funded through USAID’s Office of Food for Peace (FFP), delivers food aid to vulnerable populations and IDPs in northern and southern Syria.